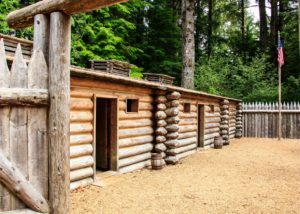 Arnie, my imaginary alter ego, reminded me that we promised Sacajawea we would come back to Fort Clatsop when we could spend more time. 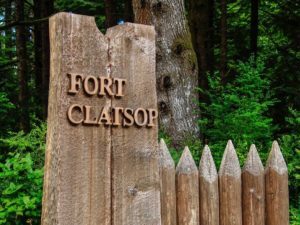 The replica of Lewis and Clark’s encampment, beautifully nestled among the trees at Fort Clatsop History National Park, was home to them during their 1805-1806 expedition. Arnie came with me, of course. “Do we have to look at trees, AGAIN?” Arnie asked sarcastically. He’s a tree whisperer, if you can believe it . . . well, he talks to whatever is nearby. I hoped he would behave himself. “That’s what’s here,” I said reminding him of the obvious. 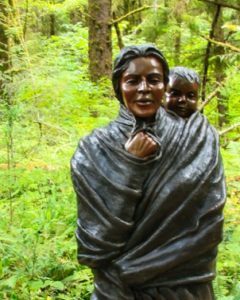 On our way past the visitor center we encountered the bronze statue of Sacajawea carrying her papoose, John Baptiste. I thought we might get by her without Arnie talking to her . . . we might have . . .but it appeared she would have it otherwise. “Sacajawea says we should be at the fort on the hour and we’ll see something spectacular,” Arnie relayed. Arnie leaned close to the statue and listened. “Reads the sun,” she says. We moved the 50 yards to the fort. 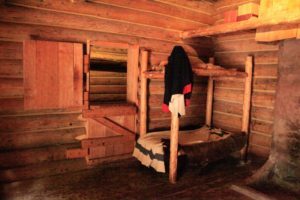 It was built of logs, two structures facing one another with a sizable open area between. One exterior of the two buildings had no openings, apparently for safety. At each end of the central space were massive wooden gates. We learned that the gates were swung open during the day and closed at night. The upright logs were pointed to prevent intruders from climbing over the gates. Indians came to the fort to barter in the daytime for goods otherwise not available to them. In return, the explorers got wild meat and edible roots dug from the ground. The interior chambers of the living quarters were fitted with the simplest furniture . . . crude chairs, tables and beds raised above the floor to avoid dampness and chill and discourage bugs and other vermin from disturbing their sleep. “Give me a Sealy Posturepedic and an easy chair,” Arnie said snarling at the primitive amenities. “Better than squatting by a camp fire and sleeping on the ground,” added. 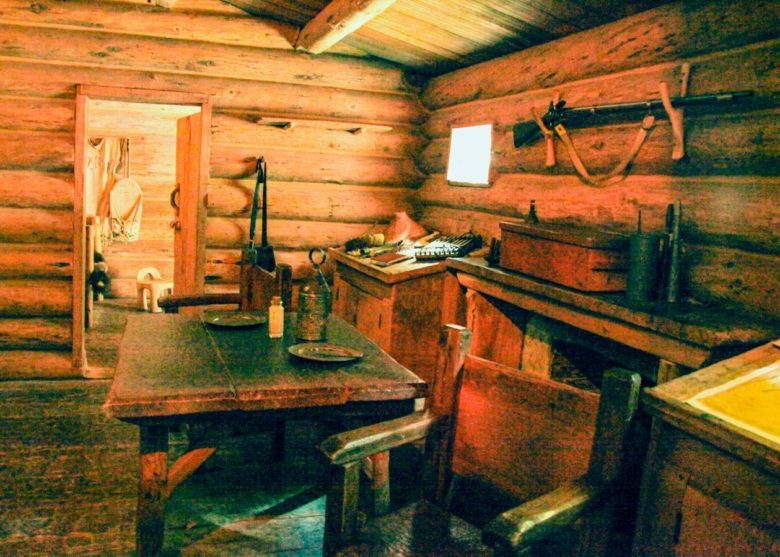 We examined each room admiring the ingenuity of the explorers for eking out a bearable existence while mapping the terrain and laying claim to this part of the Oregon territory for the U.S. Government. The noise of people gathering in the clearing just south of the fort told us that 11 o’clock was quickly approaching . . . time for the “spectacular.” I was ready. Camera in hand. A group of people circled an elderly man dressed like a trapper. 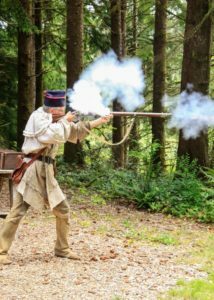 He inserted his cleaning rod in the muzzle of his flintlock rifle. He then poured in a measure of gunpowder and inserted an iron ball and a piece of wadding. He was ready for action. He raised the rifle to his shoulder and fired. An explosion invaded the silence of the forest, a cloud of smoke formed in front of the rifle. The deed was done. Sacajawea was right. It was spectacular . . . for an instant we were taken back in history to the crucial moment of the hunt. Did he get his game or not? “He missed again, didn’t he?” Sacajawea asked as we walked passed her on the way to our car. Of course, I didn’t hear her. Arnie told me what she said. A robin pecking in the soft spongy soil in a flowerbed near our car gave me an idea for a children’s story about a worm that talks a robin into becoming a vegetarian. When Arnie and I arrived back at our hotel room I loaded the pictures. I was happy to see I got a wonderful shot of Sacajawea’s spectacular sight.